We have Just Sold out of Star Wars Rogue One Electronic Lightsabers Wave 4 Case. Not to Worry! Fill in the Notify me When Available and you will be the first in line for our restock of Star Wars Rogue One Electronic Lightsabers Wave 4 Case !! From the Star Wars Rogue One collection by Hasbro. Star Wars Rogue One Electronic Lightsabers Wave 4 Case. This case contains 6 individually packaged lightsabers - 2 LUKE SKYWALKER- 2 DARTH VADER - 2 ANIKIN/LUKE/REY. 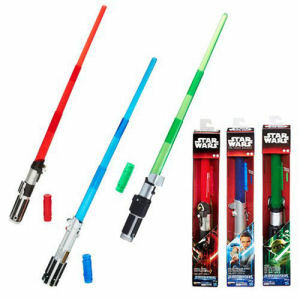 Light Sabers extend to over 30 inches long and requires 3 AAA batteries that are not included for the lights and sounds. Ages 4 and up.